The submitted widget will be displayed with the tag [asteroids]. 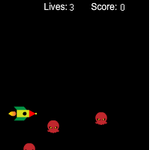 Fly your space rocket through the speeding asteroids to win this widget game. Just click on the widget's screen, and then use the up and down arrows to control the movement of the spaceship. Good luck!! Code is on the widget's webpage.